Serena Williams broke down in tears last night after being booed at the end of her semi-final at the French Open. The world number one was given a hostile reception as she was knocked out of the championships in Paris by Justine Henin-Hardenne, of Belgium, in three sets, 6-2, 4-6, 7-5. Williams was booed every time she questioned a call, even when justified, and, towards the end, every first serve she missed was greeted by loud cheers. 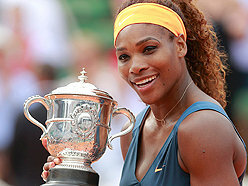 Defeat not only cost her the title she won last year but ended her run of four consecutive Grand Slam titles. "I'm not used to crying but it's a little difficult," said the 21-year-old, whose elder sister Venus went out earlier in the tournament. She said she did not believe the crowd's reaction was the result of anti-American feeling in France. "Sometimes they just want the underdog to win," she added. After initially denying that the crowd had made it harder for her, she stopped and added: "That's a lie, it does make it harder. I just have to be a little stronger next time." Williams, who side-stepped a suggestion that race might also have been a factor, said: "All my life I've had to fight and this is just another fight I have to win". She said she would return to her home in Florida to work on her serve. "I enjoy the challenge and I look forward to my next tournament at Wimbledon." THAT WAS THEN 2003. THIS IS NOW 2013. PARIS - The look in her eyes said “don’t mess with me” and no one dared to cross Serena Williams during an unforgettable French Open fortnight when the American proved she “really, really wanted” the title “more than anyone else”. Just how much she wanted it was clear for all to see when at 5.02pm local time on Saturday the world number one fired a lethal 198-kph ace, tossed her racket, sunk to her knees and arched back to let out a primal roar that went on and on and on. As his youngest daughter added more silverware to the family’s overflowing mantelpiece, a 16th singles grand slam trophy no less, Serena was left to reflect on a journey 11 years in the making. When she hoisted the Suzanne Lenglen Cup for the first time in 2002, little did she know she would have to wait until 2013 to experience the joy of winning the claycourt major again. “After 11 years it’s incredible. I want to come back here and win again. I think I’m Parisienne,” a delirious Serena told the crowd in French after becoming the oldest woman to win the title since tennis went professional in 1968. The last time she triumphed at the spiritual home of claycourt tennis, the 31-year-old American turned out to be an unstoppable force as she went on to complete what she dubbed the “Serena Slam”. After conquering the surface that is considered to be her weakest, it could well be game on for yet another “Serena Slam” as she is now on an astonishing 31-match winning streak following her humbling of Sharapova. The top seed, who flashed up 10 manicured fingers and then six more on Saturday to signal her total grand slam haul, completed a remarkable turnaround from 12 months ago when she surprisingly perished in the first round. “I’ve always said a champion isn’t about how much they win but it’s about how they recover from their downs, whether it’s an injury or whether it’s a loss,” said Serena who is already guaranteed a place among the all-time greats. Since that shock 2012 defeat Serena has scooped up titles at Wimbledon, the Olympics, the U.S. Open and now Paris. She has also climbed to the top of the rankings and has an incredible 75-4 win-loss record in the past 12 months. Sharapova succumbed to her for the sixth time in a year on Saturday as Roland Garros hosted a final between the world’s top two women for the first time in 18 years. The 26-year-old Russian, who was playing in the juniors the last time Serena was flashing the victory sign in Paris, has come a long way since she likened herself to a “cow on ice” on red dirt. But if she wanted to block out her dreadful record against Serena, she was in for a horrid shock because as she walked up for the opening service game, the giant screen on Philippe Chatrier Court flashed up “Face-to-Face: Williams 13, Sharapova 2”. It was little wonder the Russian was 0-40 down within a blink of an eye. But she somehow managed to blast her way out of trouble before breaking for a 2-0 lead. Greeting each one of her winners with cries of “Come On”, Sharapova capitalised on early Serena errors to move within a point of a 3-0 lead. The American simply glared, picked out her target and made the statuesque 6-foot-2 (1.88-metre) Sharapova skid around like a giraffe on ice as she smashed the ball away to break back. Serena left Sharapova grunting, lunging and scrambling in despair as she moved into a 4-2 lead but the second seed refused to roll over and dragged herself level at 4-4 when her opponent sent a backhand wide. But there was no reprieve for the Russian as Serena kept bombarding her half of the court with relentless baseline winners. The American broke serve for a third time with a screaming forehand winner that flew past her outstretched opponent. After sealing the opening set in 51 minutes it was only a matter of time before Serena moved full throttle ahead. The world number one was less than amused when she failed to convert five break points in the opening game of the second set but at 1-1 the pressure began to mount on Sharapova who surrendered serve with a mis-hit backhand into the tramlines. The 15,000 fans packed into Chatrier Court got firmly behind the 2012 champion as they lustily cheered her winners but all the support in the world could not save her from flatlining to a 13th straight defeat against Serena. Serving for the championship at 5-4, Serena thundered a 190-kph ace, boomed down a 195-kph ace and finally banged the 198- kph effort that snuffed out Sharapova’s hopes. “Getting to the Roland Garros final is not too shabby...I put up a fight today but it was not enough,” said Sharapova.